Leo and Jessie sailed to the port city of Salvador in the state of Bahia. The odds were stacked against them. Fresh out of high school, 19-year old Leo Halliwell went to Southeastern Idaho to teach. It was 1909, and sometimes after class, he would walk down to the mighty Bear River to observe a giant electric plant. The hum of the generator and whoosh of the water strangely captivated the young man. A voice within him cried, “You can do this!” From those trips to the river, Leo resolved that he would bring light and power to whole cities of people. Young Jessie woke up each morning excited to learn more about how to relieve suffering in her nurses’ training course at the Nebraska Sanitarium. She knew what her purpose in life was when she saw the smile on patients’ faces as their illnesses and pain abated. Her dream was to bring healing to as many people as she possibly could. Leo and Jessie were married on October 3, 1916, in Mason City, Iowa. The couple longed to become involved in mission work, but they had no definite plan. Then in 1920 the Halliwells accepted the church’s call to Brazil, where Leo would superintend the fledgling Bahia Mission. Unsure as to how they would fare in the mission field, Leo and Jessie sailed to the port city of Salvador in the state of Bahia. The odds were stacked against them. They were unable to speak the language. They had no money to speak of. And they had an infant son named Jack, who was prone to illness. But they were determined to make a dint for God in a country almost the size of the continental United States. As soon as they settled in, Leo, with fellow minister Gustavo Storch, began evangelizing Salvador. In a matter of years, the young evangelists and other dedicated workers had firmly established Adventism in the Bahia Mission. Yet it wasn’t until 1929, when the Halliwells traveled north to Belém on the Amazon River, that their life mission began to take shape. There, for the first time, they encountered the people who lived along the world’s largest river. They discovered a myriad of ethnic groups comprising a melting pot of cultures that could rival New York or London. They were a resilient people who had adapted well to the cycles of the river and the forest. Yet millions of them suffered from profound poverty, unsanitary conditions, and painful disease. Like Jesus, Leo and Jessie Halliwell looked upon the crowds and had compassion on them. In a short furlough to the States in 1930, they started to equip themselves for the monumental task of healing the people of the Amazon, both physically and spiritually. They took a course in tropical diseases. They focused on learning Portuguese. They raised money and generated enthusiasm. After much discussion on how best to physically reach the people, the Halliwells decided that the optimal way would be by water. So Leo set about building a boat. He had no boat-building experience, yet miraculously he constructed a craft that withstood the sandbars, shallows, rapids, whirlpools, tide pools, floating logs, and mudflats of the Amazon. It would bear the weight of thousands of people, yet would ever need only minor repairs. So ingenious was the design and the performance that the Brazilian government modeled their fleets after it, and 25 subsequent mission boats have born its name: Luzeiro (Light Bearer). 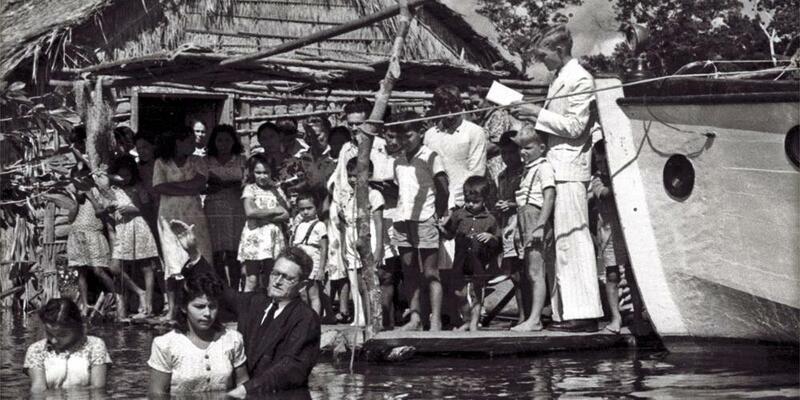 For almost 30 years the Halliwells traveled up and down the Amazon River from Belém to Manaus. It is estimated that they covered some 12,000 miles a year and traveled more than half a million miles in all. With basic medical supplies, Jessie and her workers treated a quarter of a million people for malaria, typhoid, trachoma, smallpox, and numerous other tropical ailments. Sometimes the Luzeiro team would enter a village of 3,000 or 4,000 people in which almost every person had malaria, and they would leave with everyone healed. Other times, the most basic of medicine would cure a disease that had claimed thousands of lives before the Halliwells arrived. Their son, Jack, contracted malaria early on, but amazingly, Leo and Jessie’s first bout came after 17 years. They suffered like everyone else, taking the medicine they had proffered to so many. Leo and Jessie taught the Indians about God, the Bible, basic hygiene, sanitation, proper eating, and temperance. They trained health workers who would replicate their work when they left. They established clinics, hospitals, and schools. Jessie delivered countless babies, many of which would bear her name. After nightfall, Leo would set up a screen on the banks of the Amazon, stringing wires from a generator on the Luzeiro to his slide projector. Dozens of canoes, filled with people listening to Leo’s lectures, bobbed on the river. Wherever he went, he drew large crowds. All of this created a ripple effect throughout the vast territory. Thousands were baptized, and many churches were established. The work of the Halliwells shone like a bright light across the continent. The Brazilian government donated millions of dollars in money, supplies, personnel, and other resources to the missionaries. The government also awarded them its highest honor—the Cruzeiro do Sul, or the National Order of the Southern Cross. Their name is so renowned in the Amazon region that more than half a century later, it is still spoken with reverence. Children named Leo and Jessie have in turn named their children Leo and Jessie. The scenes of the boat of mercy and salvation, to which thousands flocked for love and healing, is indelibly imprinted in the collective memory of the people of Brazil. To view more pictures for this article and to read more articles click here. Benjamin Bakeris the assistant archivist at the Seventh-day Adventist world headquarters.